We’d love your help. Let us know what’s wrong with this preview of The Power Of Less by Leo Babauta. With the countless distractions that come from every corner of a modern life, it's amazing that were ever able to accomplish anything. 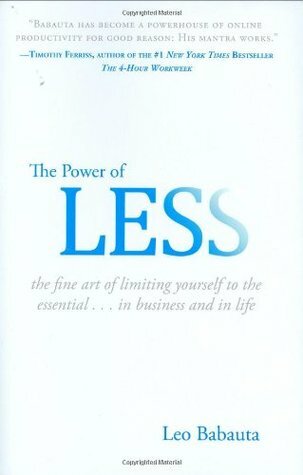 The Power of Less demonstrates how to streamline your life by identifying the essential and eliminating the unnecessary freeing you from everyday clutter and allowing you to focus on accomplishing the goals that can change your life for the With the countless distractions that come from every corner of a modern life, it's amazing that were ever able to accomplish anything. The Power of Less demonstrates how to streamline your life by identifying the essential and eliminating the unnecessary freeing you from everyday clutter and allowing you to focus on accomplishing the goals that can change your life for the better. To ask other readers questions about The Power Of Less, please sign up. This book can change your life. It did mine before I was finished reading it, and that was totally unexpected by me. I thought the book was about paring down the material things in life, but it's only marginally about that. It's about finding what's important and essential in your life and getting back control and personal time to do the things you love. The book is easy to read and could be a fast read, but I suggest you take your time. Try out some of the suggestions. They work! The concepts i This book can change your life. It did mine before I was finished reading it, and that was totally unexpected by me. I thought the book was about paring down the material things in life, but it's only marginally about that. It's about finding what's important and essential in your life and getting back control and personal time to do the things you love. The book is easy to read and could be a fast read, but I suggest you take your time. Try out some of the suggestions. They work! The concepts in the book can pertain to almost anything in your life -- it's really that versatile. This author has his priorities right and wants to help all of us get them right. Apply what you learn here to your life, work, health, weight, addictions, just about anything, and you can begin today to make changes that will produce a happier, more productive you. And it's not hard. Baby steps. Easy, easy. Everyone should read this book -- every person who isn't already on Mr. Babauta's plan or plans for making changes that will change lives. If you're stressed, have too much on your plate, never have time to relax and do things you're passionate about, read this. If you want to make changes in almost any area of your life, read this book. Everything about this book is doable and will work if you will just do it. If you give up easy, well there's a chapter on that too. There are two types of people in this world: those who don't like reviews that start by sorting people into simplifying categories, and those who do. Goodbye to the former. Now we're left with those who appreciate the clarity and insight provided by lightly-held categories and stereotypes. And we move on. I'm not sure who this book is for, or whom. Bc there are three types of people in this crazy, crazy world in which we live, in. 2. Tho There are two types of people in this world: those who don't like reviews that start by sorting people into simplifying categories, and those who do. Goodbye to the former. 3. Those who actually respond well to structure. -1's won't read this book, (although frankly they cd benefit from the holistic, Zen-like approach of this guru) -- so the book is not for them. -2's don't need this book bc they will never "have it together", nor should they strive for that -- so the book is not for them. -3's have developed a way to force external structure on themselves (which they can respond to), and so will write the next instantiation of this book -- so it's not for them. Which leaves nobody for the book. Except maybe the other half of 3's (bc there are two types of 3's in this world), who will benefit from a social media manifestation of this approach, where they can blog and comment to each other about how to apply the Master's teachings in the nitty-gritty of everyday life, and help each other stay accountable. But the author already had a blog just like this, just as I described, already, before he wrote the book. So why the book? Don't know. Don't buy it, just google the author. I have some problems with this book. The general principles seem pretty straightforward, but as you read deeper into it, you become confused. 'Pick one...', 'pick five...', 'make a list of three...', 'just one at the time', 'single task - when you showering or driving don't think about anything else', vs. 'use your driving time to think about...', 'write down' vs. 'go paperless' etc. It's all simple and useful, but for a book on setting limitations, it could have a much simpler hierarchy of thin I have some problems with this book. The general principles seem pretty straightforward, but as you read deeper into it, you become confused. 'Pick one...', 'pick five...', 'make a list of three...', 'just one at the time', 'single task - when you showering or driving don't think about anything else', vs. 'use your driving time to think about...', 'write down' vs. 'go paperless' etc. It's all simple and useful, but for a book on setting limitations, it could have a much simpler hierarchy of things, so you don't get lost in what's a Goal, what's a Task, what's a Habit and what's a Commitment. Also, the examples could be more diverse - not everyone has a creative job or an office job (or any job for that matter), not everyone lives in a house or an independent household. Of course the reader can apply the tips to her or his own life, but it would be nice if the author himself included some examples showing a different lifestyle than his own (instead of repeating himself quite a few times). I share my room and my desk with my partner, and we share the rest of the house with another person. I may not always be able to make the changes I want in a space that doesn't belong to me. Of course there's ways around it, you can negotiate with your partner or flatmates, and I'm pretty sure the author had to make some compromises with his wife and kids, but he just doesn't mention it. The book tends to overlook other people's needs and habits, portraying them as either YOUR 'quality time' partners, people that help YOU stay motivated, people YOU report to, or people that interfere with YOUR schedule - but not as active subjects with their own schedules you need to respect and sometimes cooperate with. Although it is ridiculous on the face of it to take advice on how to simplify your life from a man who has fathered six children, this audiobook resonated with me right now and I've already implemented at least one thing from it this week that has been helpful. There's nothing new here. So what's the value added? First of all, it's just refreshing that the author doesn't make false claims about bringing us some amazing new science of whatever. Secondly, the narrator has a friendly, encouraging t Although it is ridiculous on the face of it to take advice on how to simplify your life from a man who has fathered six children, this audiobook resonated with me right now and I've already implemented at least one thing from it this week that has been helpful. There's nothing new here. So what's the value added? First of all, it's just refreshing that the author doesn't make false claims about bringing us some amazing new science of whatever. Secondly, the narrator has a friendly, encouraging tone. Beyond that, it's a compact compendium of practical action items that otherwise would require wading through a bathtub full of books and a lot of unnecessary blah blah. Because the author is just repeating standard advice from all over the place, some of the details are somewhat incorrect (e.g. low fat diet) or self-contradictory or trite, but the general approach is to spew out all kinds of tips to choose from to see what works for the reader. Given that repeated admonition, I can let the minor weaknesses slide. While this was a pleasant and easy read, Babauta's approach to personal productivity is a little impractical for normal people. Much of his advice regarding the workplace requires a high degree of autonomy to implement. Additionally, much of his advice regarding the workplace will seem very familiar to those of you who have read anything by David Allen. Every page or two you encounter concepts like project lists, tickler files, one-way inboxes, breaking projects into discrete actions, or having While this was a pleasant and easy read, Babauta's approach to personal productivity is a little impractical for normal people. Much of his advice regarding the workplace requires a high degree of autonomy to implement. Additionally, much of his advice regarding the workplace will seem very familiar to those of you who have read anything by David Allen. Every page or two you encounter concepts like project lists, tickler files, one-way inboxes, breaking projects into discrete actions, or having a single alphabetical reference system. Babauta does do a good job of modernizing a few of David Allen's GTD concepts (such as recommending digitizing as many documents as possible when archiving). The parts of this book that were more original were very good, such as Babauta's advice regarding achieving goals one at a time or how to stay motivated. I read a few books about minimalism lately, because truth is I tend to be both a hoarder and excessive buyer, habits I need to stop as they're wrecking havoc with my nerves every time I open my closet, as well as my finances. This book however is mainly about living with less commitments and not less stuff (even though cleaning your clutter is mentioned briefly). And of those commitments, two kinds are discussed in length: work commitments and those concerning health and fitness. For better or worse neither of those were of interest to me, as it's my after work hours that are stressing me out on a daily basis. Unfortunately, if you take out the passages about work, there's not much left to read in this book, since as far as I can tell, almost all chores at home are unavoidable. You can't say for example that cooking is unnecessary, or grocery shopping, or doing the laundry or the kids' soccer practice and certainly not their doctor's appointments. The author also says that you have to focus on each and every task you do and not let your mind/focus wonder elsewhere, but I feel that once again this is neither necessary nor applicable outside work; I understand the idea of focusing on one project at time, but do I really need to focus on only one of my sons' school progress and not my diet or the other son's progress at the same time? The message is IMO to take everything you read with a grain of salt, because everything works differently for everyone. Why the 3 stars you ask then? The first chapter: Setting limits. This chapter really was an eye opener. Our time is limited, 24 hours a day, no more, no less. In order to live a better/more peaceful life, you have to set some priorities about what you consider a 'need' and what a 'want' and also set time limits about certain tasks. The author uses the example of surfing the Internet or checking one's emails only at certain times each day, so you don't get carried away and ignore other stuff that's in fact more important to you. Also writing down a list of things and distinguishing between 'wants' and 'needs', makes it easier to decide not to spend money on yet another sweater, but to use them to take my kids for an evening out instead, as the second's more important to me. I think you get the idea here. The author also has one other proposal: when you want to do/eat/buy something that's not necessary, sit down and wait a little while; more often than not, the urge to do it will leave soon, as urges come in waves :P If after the wave passes (that could be 30 days for something you want to buy or 30' for a cigarette or burger you crave) you still want to do it, then go ahead and do it! I do like that idea very much and definitely plan to try it out, as impulsive buys are my biggest pitfall. What I have not seen said, however, is the main point of this book: Living with less will make you a happier person. While Leo goes into great details about how to live with less, why it is good, how it can help, etc., the main point is that you will be happier. Not only by living with l Since there are many other (excellent) reviews for this book, I won't repeat what has already been said more than this: this is a great book that explains how effective and powerful minimalism can be in your life. A mindful approach to effectively simplifying your life. He has enough tips and ideas for just about anybody. This is about slowing down, yet getting more done by only focusing on the most essential things in your life. We can't do everything but we can do what we need to do in a calm state of mind, not a hectic one....I have already applied his ideas to my life and gotten more done by simplifying--even on the job I slowed down and yet got more done...This is genius. Leo Babauta writes: "There has never before been an age in which we could get so much done so quickly. There also has never before been an age in which we were so overwhelmed with information and tasks, so overloaded with e-mails and things to read and watch, so stressed by the incredible demands of our lives. "For many people these days, work is a constant stream of e-mails, of news and requests, of phone calls and instant messages, of papers and notes and files. The day starts with an in-box fu Leo Babauta writes: "There has never before been an age in which we could get so much done so quickly. There also has never before been an age in which we were so overwhelmed with information and tasks, so overloaded with e-mails and things to read and watch, so stressed by the incredible demands of our lives. "For many people these days, work is a constant stream of e-mails, of news and requests, of phone calls and instant messages, of papers and notes and files. The day starts with an in-box full of e-mails, and ends with an in-box just as full, and each e-mail represents a request for information or for actions that we don't have time to fulfill. We are drinking from a fire hose of information, with no idea of how to reduce the flow. "It's stressful and wasteful. And if we stop to think about it, it's not how we want to spend out lives." And he is completely right. We don't want to live stressed out lives, constantly coming and going but never arriving. We want to live lives that matter, lives that influence others, lives that are slow and thoughtful and deep. We want to live lives that are intentional, lives that create the pace rather than try to keep up with it. And that is exactly what The Power of Less is all about. Slowing down and focusing on one thing at a time, both simplifying and intensely focusing on the task or circumstance directly in front of us. So how are we to live this type of life? Are we to have a Waldenian character constrained to the woods, or grow with the times and learn to process the vast amounts of information we see in our everyday lives? The author proposes a dramatic middle ground for the way we consume information but not let ourselves be overloaded by it: That is "one where we can still enjoy access to vast amounts of information, still have instant communication when we want it, still get things done quickly—but one in which we choose how much we consume and do." In fact, everything in the book comes back to this simple statement: "Focus on the essential and allow everything else to drop away." 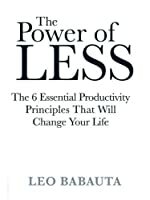 While the first part of the book deals with the principles of living with less, the second part gets more practical in how to actually implement some of the theoretical ideas at the beginning—goals, projects, tasks, time management, e-mail, internet, filing, commitments, daily routines, decluttering your work space, slowing down, health and fitness, and motivation. Though pretty obvious, the simple way the author broke down how to achieve goals really stuck out to me: Choose a goal. Break it down into sub-goals. Break the sub-goals down into weekly actions, and those weekly actions into daily tasks. Then those daily tasks are going to be part of your MITs (Most Important Tasks) that you do every day. This book takes the premise that we are so wrapped up in being busy (because being busy is the new status that everybody seeks, "I work ergo I have status") that we are in fact far less productive than we actually believe. The author tells a compelling personal story of how he de-cluttered and minimalized his own life and as a result became physically fitter, lost weight, gave up smoking, paid off his debt, and built financial security. The bulk of the book is an easy to follow model which seeks This book takes the premise that we are so wrapped up in being busy (because being busy is the new status that everybody seeks, "I work ergo I have status") that we are in fact far less productive than we actually believe. The author tells a compelling personal story of how he de-cluttered and minimalized his own life and as a result became physically fitter, lost weight, gave up smoking, paid off his debt, and built financial security. The bulk of the book is an easy to follow model which seeks to establish a balance between focus and goal setting. The author argues that by working on one major goal at a time, with a realistic timeline, focus naturally follows - living in the now, de-cluttering, minimizing are all side benefits of becoming focused on one particular goal. I read it in less than a week, and I loved every sentence of it. If you want something, get it. If you want everything get it all, just one thing at a time. Live in the moment, whatever you're doing, do that, and only that. Slow down, and be happy. I've looked for some time for a good secular book that looks into notions of things like meditation, mindfulness and such without all the mysticism. This book is squarely non-mystical and glances that target. Unfortunately, I couldn't get all of the value out of the audiobook as much of what I think will be valuable are exercises to be written down and done, practices to include in 10k, 30k and 40k gtd reviews and other things that you can't simply remember. I finished the audio a few days ago a I've looked for some time for a good secular book that looks into notions of things like meditation, mindfulness and such without all the mysticism. This book is squarely non-mystical and glances that target. Unfortunately, I couldn't get all of the value out of the audiobook as much of what I think will be valuable are exercises to be written down and done, practices to include in 10k, 30k and 40k gtd reviews and other things that you can't simply remember. I finished the audio a few days ago and today just received a paper copy I'd ordered. This is a good enough book to read twice back-to-back, with the second time focused on doing. It's a good book. It's repetitive and a bit outdated (I heard Google reader somewhere) but all the hints here are still valid. To summarize: focus is everything. Chose something you want to do and do it. Remove everything else that's not moving you toward your priorities and do what you have to do. He lists some actionables that can help you on this journey, but there's no miracle here (as expected), you just have to focus and get things done. For me it was a bit repetitive because I alread read a It's a good book. It's repetitive and a bit outdated (I heard Google reader somewhere) but all the hints here are still valid. For me it was a bit repetitive because I alread read about almost everything he says on this book, but I would recommend reading if you're not into minimalist, productivity and focus. * Follow your values when deciding what is essential. What is more important to you? * Second question to find the essential: what are your goals? * Third: What do you love? * Four: what is important to you? * Five: what has the biggest impact? * Six: what has the most long-term impact? * When people want something but you don't think it's essential, learn to say no. Saying no is prioritization of the essential. Make your reasoning clear and they will respect your time and appreciate your respect for their time. * Focus on one thing. If you're walking, just walk and feel the present. * Set your MITs (most important tasks) every morning. Make this a habit. * If a goal is too big, break it into sub-goals. Instead of "become a lawyer" use "get into the law school". No more than one-year goals. * Add 3 priority tasks to your list every day, and at least one must have an MIT that move yourself towards one of your goals. Do it as the first task, in the morning. Whatever else you accomplish will be an extra. * Stacking pager doesn't work. Use a file and a simple alphabetical system to file. File it right away. * Create a short list of things that contribute to your life and values. Leo's list includes: 1. Spend time with his life and family. 2. Writing 3. Running 4. Reading. These are his essential commitments, what are yours? Leo addresses many important issues in improving your life, such as the power of habit, and how one should make only small changes at a time. I read this book already sold on becoming a minimalist, and wanted some practical advice. I like Leo's writing style - very friendly and helpful, and shows the wisdom of experience. However, despite his emphasis on making small changes, it isn't clear how to get started with his program. Each chapter gives a different strategy and it's not clear how to apply Leo addresses many important issues in improving your life, such as the power of habit, and how one should make only small changes at a time. However, despite his emphasis on making small changes, it isn't clear how to get started with his program. Each chapter gives a different strategy and it's not clear how to apply them all together. He talks about having One Goal at a time (6-12 months). But also three projects (1-4 weeks each), one of which should be related to the goal. So, from where do I draw my other projects? We should also have three Most Important Tasks for the day. One of the MITs should be related to one of your goals - but wait, you should only have One Goal. And then later he says each MIT should be goal-related, or related to one of your three projects. And to batch small tasks like email. You should do all the MITs first thing in the day, just after drinking some water to wake you up. But wait - what if I can only a task at the office? Or only when I'm out and about? Or only in the evening? And when exactly am I supposed to get in that meditation, exercise, or a healthy breakfast? So I personally start with the meditation, then exercise, and breakfast. I set up MITs for personal things. If one of them is small I might do it before work or during break. Then I get to work, and set up my MITs, and start working on a work-related one. But I do most of my personal MITs in the evening. His lack of distinction between work and personal life makes things problematic for those of us who have day jobs. He says to just have three projects, split between work and personal time. It makes much more sense to me to have two projects at work, and two projects at home, at any given time. He says that at work our boss may be choosing our projects, and we should talk the boss into limiting it to three - so does that leave us with no personal projects? I think he is biased by his own work-from-home experience. He also says not to make appointments - just schedule time spontaneously with your friends. Well, you may just find that when you do this, they already have plans. It's respectful to other people to schedule appointments. Then he talks about making a Short List of five priorities. He talks about commitments, sometimes as equivalent to priorities, sometimes as a subdivision of them. Don't do anything that's not on this list - but cut down the commitments gradually. How are these priorities/commitments supposed to be related to the goals/projects? He doesn't really explain. He says he has only four priorities: Spending time with his wife and kids, writing, running, and reading. So, I guess he doesn't have any other friends. He never visits any other family. He never spends any time managing his money. He never participates in community activities, or takes any interest in politics. It doesn't seem that eating is even a priority for him. I think this one is really worth 3 1/2 stars, but of course that's not an option here. It's not a bad book, it's just that I think there are better and more practical productivity books out there. I think it's most effective when read as an addition to more rigorous, perhaps method-based productivity books, or if, in spite of having a system, things are still overwhelming you. It has it's good parts - Babauta makes good points about slowing down life's pace and not trying to do everything at once I think this one is really worth 3 1/2 stars, but of course that's not an option here. It's not a bad book, it's just that I think there are better and more practical productivity books out there. I think it's most effective when read as an addition to more rigorous, perhaps method-based productivity books, or if, in spite of having a system, things are still overwhelming you. It has it's good parts - Babauta makes good points about slowing down life's pace and not trying to do everything at once. Single-tasking, limiting the number of things you divide your attention between, consciously slowing down while driving are definitely all things that help us to be less stressed - but I also wonder how long it's been since the author was in a real-life office environment; whether he ever went to his boss and said "From now on I'm only going to work at three projects at a time". Sure, some bosses may be sympathetic and some people may be able to get away with just doing it and not telling anyway, but I suspect the majority of people won't be able to follow through on this one. From my own experience, generally I find myself in a team that hasn't enough people, where we report to someone who is reporting to someone else, who is reporting to someone else again, and at each level of that heirarchy projects are being invented and pushed down the chain to us lowly minions at the bottom who get stuck with trying to achieve all this with little option to push back. It's a brilliant theory, but I don't think it's terribly practical. This book espouses a philosophy that I acknowledge the wisdom of: focus your attention on the things that really matter, in part by cutting the things that matter less. There were some solid chapters with good material--one that summed up a lot of the most valuable aspects of Getting Things Done: The Art of Stress-Free Productivity, and another chapter or on forming or changing habits. That being said, I didn't feel as though I walked away with the feeling of being fired up about how to apply th This book espouses a philosophy that I acknowledge the wisdom of: focus your attention on the things that really matter, in part by cutting the things that matter less. There were some solid chapters with good material--one that summed up a lot of the most valuable aspects of Getting Things Done: The Art of Stress-Free Productivity, and another chapter or on forming or changing habits. That being said, I didn't feel as though I walked away with the feeling of being fired up about how to apply this philosophy. It may have been more impactful to someone not already exposed to what is considered common wisdom in the productivity/live-hacking scene: multitasking, both on the micro and macro scale, is generally counterproductive. Higher quality and more sustainable work is achievable through focus and a slower pace. As always with this type of book, there are a few good ideas that I'll try, and quite a few more that make me scratch my head and ask, "who could get away with this?" I certainly want to simplify and focus in the new year (2016) and probably the major idea I like from this book is that of choosing the three most important things I want to accomplish at the very start of the day. My job revolves around a lot of interruptions, changes, and new tasks, but it's important that I don't lose sight of wh As always with this type of book, there are a few good ideas that I'll try, and quite a few more that make me scratch my head and ask, "who could get away with this?" I certainly want to simplify and focus in the new year (2016) and probably the major idea I like from this book is that of choosing the three most important things I want to accomplish at the very start of the day. My job revolves around a lot of interruptions, changes, and new tasks, but it's important that I don't lose sight of what I judge to be most important that day. Some of the author's suggestions are downright unusual. My favorite wacky idea is that of not setting appointments with people, at all. Yikes. That might work if everyone used the same planning and organizing principles, but ideas like that really fail to respect other people's working styles; some of us really depend on our appointments and meetings to make progress on things. I read this book for my Personal Development book club and honestly, didn't learn a whole lot of anything new as someone who has been on a mission to simplify my life and the lives of others. Still, the book is very well-written and served as a reminder to determine and then focus on priorities and let go of the rest. A typical pep-talk exhortation--nothing wrong with it, but not much new, either. Doesn't solve the problem of motivation, but then, who has solved that? One suggestion about dealing with communication on one's own schedule--how about the folks on the other end? Read this for a library book group--otherwise wouldn't have finished it. The author was extremely repetitive but he had a lot of good points and tips that I am willing to try. There was nothing new here for me, however, i read a lot of books on this subject, so it wouldn't be fair to blame the book for it. There is a lot of useful advice here for sure. Ironically, a book about simplicity and "limiting yourself to the essential" has become the eighth addition to my currently-reading list! But I know other people have holds on it, so I only have two weeks to read it before it has to go back to the library. I read Leo Babauta's Zen Habits blog (http://zenhabits.net/) all the time, and find it challenging and inspiring. Interestingly, earlier this year I was reading Ten Natural Laws of Success and Time Management and contrasting his very organized, Ironically, a book about simplicity and "limiting yourself to the essential" has become the eighth addition to my currently-reading list! But I know other people have holds on it, so I only have two weeks to read it before it has to go back to the library. I read Leo Babauta's Zen Habits blog (http://zenhabits.net/) all the time, and find it challenging and inspiring. Interestingly, earlier this year I was reading Ten Natural Laws of Success and Time Management and contrasting his very organized, plan-based approach to figuring out your life with posts on Zen Habits at the time, telling me to stop planning and setting goals and just do the one thing I'm most excited about right now. They seemed to be totally opposite approaches. However, the early chapters of this book clearly contain the advice to figure out what you value, set your goals based on those values, and set your tasks to accomplish those goals. That's exactly what Ten Natural Laws said! I wonder if Leo Babauta has changed his mind about all this in the two years since this book came out, or if I misread his blog? In any event, I'm finding all this minimalism stuff very inspirational right now. Even if I never do the things the book and blog authors suggest, just reading these things is giving me a ton of energy to accomplish things I've been putting off for months. Three cheers for that! Ok, I rechecked the blog. Specifically, this post certainly seems to contradict all the planning, goal-setting, and list-making advice in this book. Very curious. Overall, I'd say this book was pretty good. The beginning was the most interesting, about why and how to limit yourself to less. The idea is that the 80/20 rule applies to life and to-do lists as much as it seems to apply to everything else, so cut out all but that results-dense 20%. You'll spend a lot less time and energy doing but accomplish a lot more that's actually important. He suggests picking one habit at a time to work on setting/changing, and throwing all of the energy you can at it for a month, until it's set. Then you can move on to the next one. He also suggests doing it in tiny baby steps so that you're assured of success at each step and you can build on the high of each of those small successes. Another suggestion is picking only one goal to work toward (a goal being a 6-12 month sort of thing), and picking three projects at a time to be your working projects. Projects are more like 1-month things. Pick the top three and work all three to completion before picking your next set of three off your master list. That way you can't have one just languishing around on the working list but never getting done. Focus on finishing them--at least one of your daily tasks should be on these projects. At the smallest level, he suggests picking three Most Important Tasks for each day and accomplishing those first so you make sure they get done. Again, these should relate to the three working projects. It's all very structured and organized. I find this sort of system effective for awhile, but somehow I never stick with it over the long haul. It's doing great for me right now, though, and I guess I'll enjoy that as long as it lasts. The second half of the book goes into detail about how to simplify different areas of your life, including email, eating, filing, exercise, etc. I found it a little too obvious to be all that interesting or inspiring, but I've kind of been working on this for a while now. Also, weight loss started taking over as the main example, so it started seeming more and more like advice from some tedious women's magazine. He also lists ways to get re-motivated as the project goes on. They were kind of obvious. Just keep doing stuff, and either you'll like it again eventually, or you won't, in which case maybe you should quit. And then, suddenly, the book ends! as if he got sick of writing it and just couldn't deal with writing a conclusion paragraph or anything. Maybe when he was limiting himself to the essential for this book, he decided a conclusion wasn't essential. It's sort of ironic that my main criticism of this book is that it could have been a little shorter. Still, it IS a very helpful book in producing more productive habits, and I've been more productive since reading it and applying some of its techniques in my life. Leo Babauta's premise, that by trying to do too much, we actually accomplish less, is completely sound. His admonition to focus in a world full of distractions and multi-tasking is definitely needed. The most helpful suggestions for me It's sort of ironic that my main criticism of this book is that it could have been a little shorter. The most helpful suggestions for me in this book were the "top three" ones. One is that you make a long list of ALL the ongoing projects you're working on (basically anything that can't be accomplished in a few hours.) Then, you choose three of those projects to focus on. You can NOT add any other projects to that list until you've completed all three. In a similar vein, each morning you're instructed to make a list of three "most-important-tasks." This is three tasks total, not three work tasks, three personal tasks, etc. And then, you start working on those tasks immediately, even before : gasp : checking your email. This is the tip that's helped me be most productive, and it's good for me to learn anew to prioritize every morning. Of course, usually I end up accomplishing much more than the three items on the list -- but I always at least accomplish those, meaning that every day the most important tasks get done. I've also been more productive due to fighting the urge to mujti-task, and resisting checking my email more than twice a day (personal) or once an hour (business). There are a few suggestions in this book I'm going to blatantly disregard, though, like the one about being "present" and not trying to "multi-task" while doing simple things like washing the dishes or driving. Um, you're giving this advice on an audiobook? My guess is that audiobook listeners are expert simple-task-multi-taskers. I am NOT giving up my audiobook time to be more "present" in boring tasks -- not having my audiobook "carrots" would probably make me a lot less productive in taking care of pesky chores, period! This book was very obvious. While I picked up one or two good tips, the overall message was pretty common sense. این کتاب و چند تا کتاب دیگه رو زمانی خریدم که رفته بودم شهر کتاب مرکزی، این کتاب رو انتشارات هنوز ترجمه و چاپ کرده و به نظرم هم ترجمه نسبتا خوب و روانی داشت و هم کیفیت چاپ و طراحیش خوبه، نویسنده کتاب لئوباباتا هست و زحمت ترجمه هم خانم لیلا شاپوریان کشیده، دستشون درد نکنه، کتاب خیلی خوبی بود، حتی یک هفته گذشته به دستورات کتاب عمل کردم و اتفاقات خوبی برام افتاد و قصد دارم این هفته هم با یک برنامه جدید ادامه بدم، از این کتاب هایی که صرفا چند تا نکته سر هم بندی کرده باشه نبود، حرف های خوب و کاربردی این کتاب و چند تا کتاب دیگه رو زمانی خریدم که رفته بودم شهر کتاب مرکزی، این کتاب رو انتشارات هنوز ترجمه و چاپ کرده و به نظرم هم ترجمه نسبتا خوب و روانی داشت و هم کیفیت چاپ و طراحیش خوبه، نویسنده کتاب لئوباباتا هست و زحمت ترجمه هم خانم لیلا شاپوریان کشیده، دستشون درد نکنه، کتاب خیلی خوبی بود، حتی یک هفته گذشته به دستورات کتاب عمل کردم و اتفاقات خوبی برام افتاد و قصد دارم این هفته هم با یک برنامه جدید ادامه بدم، از این کتاب هایی که صرفا چند تا نکته سر هم بندی کرده باشه نبود، حرف های خوب و کاربردی زده بود حتی زمین خوردن و اینکه ما آدم ها خیلی سخت عادت می کنیم هم در نظر گرفته بود، به نظر من اگر فرصت دارید و تصمیم دارید تغییراتی در زندگی تون ایجاد کنید، وقتش هست، بر خلاف عنوان کتاب همه کتاب درباره کار کردن نیست، به نظرم بیشتر درباره زندگی نوشته بود، البته نکاتش هم درباره کار باعث نوع نگاهی در من شد و راندمانم در این هفته نسبت به هفته های پیش بهتر شد. کتاب مفیدی بود ولی از یه جایی به بعد دیگه همه حرفاش تکرار همون حرفهای بخش های اول میشه. یه سری راهکارها ارائه میده برای اینکه چجوری بشه تو همین وقتی که داریم همون کارهایی که برامون در اولویته و واقعا دوست داریم انجام بدیم رو بتونیم تموم کنیم. خوندن و عمل کردن به راهکارها و اصولی که پیشنهاد میده میتونه کمک کننده باشه. He started Zen Habits to Leo Babauta is a simplicity blogger and author. He created Zen Habits, a Top 25 blog (according to TIME magazine) with 260,000 subscribers, mnmlist.com, and the best-selling books focus, The Power of Less, and Zen To Done.